The First Presbyterian Youth Ministry assists our parents in training and making disciples of their children. The discipling of our students is twofold. First, we want to make sure they have a fundamentally and doctrinally sound understanding of Scripture, particularly what it teaches about salvation. We want them to know that salvation is by grace alone, through faith alone, in Christ alone. Then we want them to live lives of obedience to the Word of God, not to gain salvation, but in response to salvation. Second, we want to live out the gospel in front of them. This happens as we spend time with them in fellowship and community. In order for that to occur, we must have programs that are first and foremost centered on Scripture, as well as engaging to the students. We also want to have times of fun and fellowship. These two things can occur during the same meeting and/or at separate times. Our hope is that the programs we develop will incorporate all of these principles fully. The end goal is to glorify God by producing mature Christian adults who will know Christ and make Him known for a lifetime. Submitting to God’s Word as our guide for knowing Him and living our lives. Ministering not just to youth but to families both within and outside First Pres. Building authentic relationships. Having fun. Serving those in need. Praying constantly. Learning how to glorify God with our gifts. Looking to the gospel of Jesus for identity and purpose in the world. Connecting with the whole body of Christ at First Pres. Cultivating relationships with Christians both citywide and worldwide. Taking the Gospel to those who don’t know Christ. Sunday School 10 AM-10:50 AM During the school year, we meet in the Garage for breakfast and fellowship. We then watch a teaching video from one of the great pastors featured on Right Now Media website. Teaching pastors include Francis Chan, Matt Chandler, Joshua Harris, Eric Mason, and others. The topics covered range from basic doctrine to identity in Christ. Sunday Nights MOVE 5:30-7:30 PM We eat together and hang out upstairs int he Lounge and then head over to the Garage for our exciting gathering, where we play games and learn from God’s Word. We hang out and play ball for an hour afterward. Wednesday Nights 6:30-7:30 PM Small groups: Dinner, Bible study, and Games. Everyone meets at the church and then divides into groups. Our fall retreats have been held at Ridgehaven Retreat Center in Brevard, North Carolina. Fun in the Son: For high school only, this is another great conference/camp done by YCM. 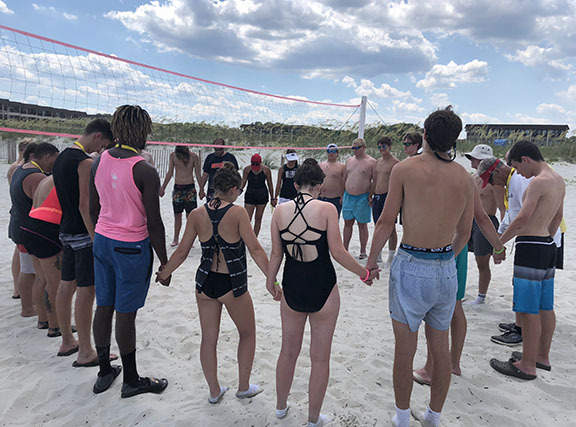 We travel to Hilton Head Island off the coast of South Carolina, for a week for this fun and encouraging time, where the Gospel is presented through music, speaking, and creative arts. 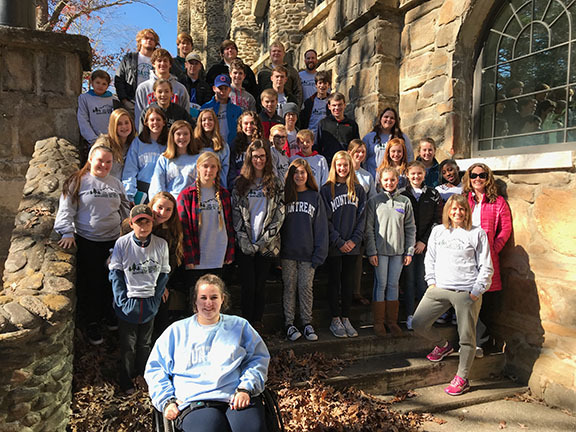 The purpose of the YLC is to train student leaders within the youth group to assist in the execution of First Presbyterian Church’s youth program. The purpose of the youth program at FPC is to assist our parents in training and making disciples of their children. First, we want to make sure that they have a fundamentally and doctrinally sound understanding of scripture, particularly what it teaches about salvation. Then we want them to live lives of obedience to the Word of God, not to gain salvation, but in response to salvation. Second, we want to live out the Gospel in front of them. YLC members will understand and practice these principles, as well as assist in sharing them with other youth members. Members of the Youth Leadership Council will be expected to conduct themselves as responsible and conscientious participants during all youth programs, assist in planning MOVE on Sundays at FPC, assist in planning and executing retreats/trips, help promote meetings and events, actively invite friends to participate in youth events, attend Youth Leadership Council meetings, attend Student Leadership University’s Leadership conference in Orlando, and finally, commit to being trained in discipleship. 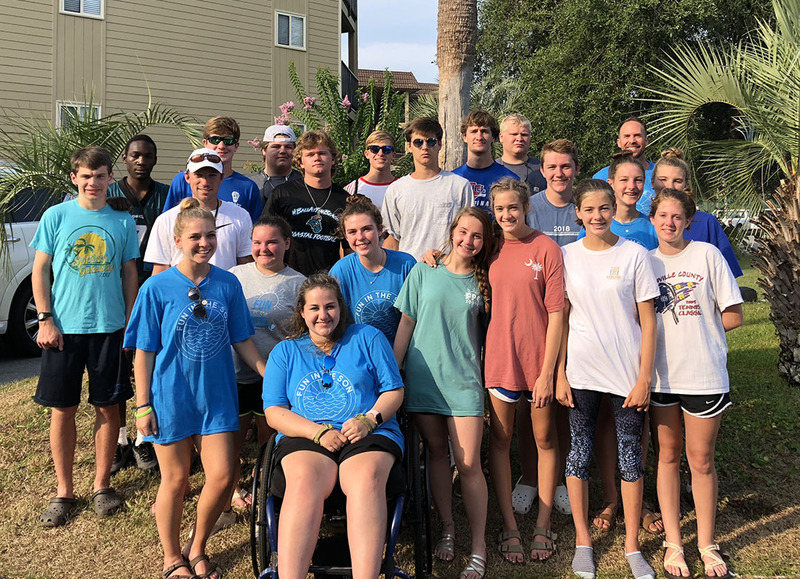 OTHER THINGS WE DO: Super Bowl Party, Lock-In Overnighters, East Florence Mission, Skateland Social, Christmas Party, Beach Trips, End of Summer Trip, Bonfire, Fall Road Trip, and Spring Getaway. For more information, contact Youth Ministry Director Brock Page.